We believe Unconventional Business Leaders are people with Integrity. John inherited the family manufacturing business the day the company filed for bankruptcy. The bankruptcy judge forgave millions in debt, but John’s faith and integrity guided him to repay those debts anyway. It took him years, but John finally repaid every vendor that lost money in the bankruptcy. 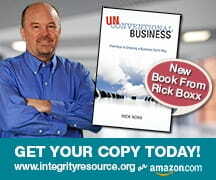 If you desire to be an Unconventional Business Leader, let integrity guide you to standards higher than the law.